They are surrounded by an inscribed rim. The base of the bowl is also inscribed. The baluster stem has four compartments containing carnations, the conical foot is engraved on the upper side with radial compartments containing carnations. Purchased from Messrs. S.N. Nyberg, 16c Grafton Street, London, W1. 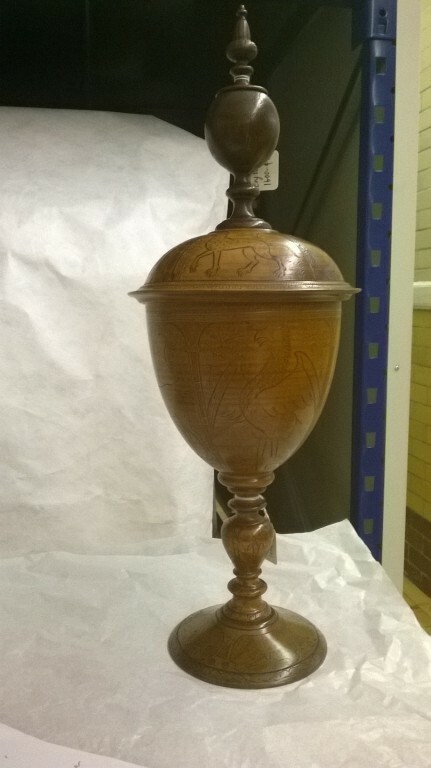 'This notable standing cup and cover, offered for sale by Nyberg at £90, was brought to our notice by Mr. H. Clifford Smith, who as you know was working on its kind some years ago. This important early 17th century family of maple etc., cups, akin to mazer bowls, consists as you know, of more than a dozen recorded pieces engraved ornamentally with heraldic beasts of specific noble families and with pietistic verses and texts. These have long been regarded as Eucharistic, but the use has been uncertain. Investigations in progress suggest that the cups are pietistic, not Eucharistic, and were used as loving-cups (with allusion to divine grace) at Laudian versions of The Banquet (of Marchpane). We have a long description of such Banquet, at a jocular level, with Month trenchers, Zodiac sugar-plate modelling and a "sun-cup"; an inscription on one cup, half-jocular, half-pious; and a cup which is also a trencher-box. The exact use of this type of cup is not clear. 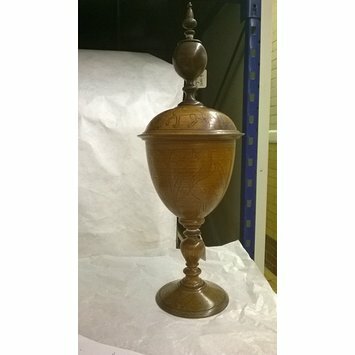 It had been thought that they were fashionable communion cups, although the use of wood as a vessel for the host had been forbidden by the Canons of Winchester as early as 1071. Pinto relates that they could have been the cups of Royal Cupbearers, and though some of the crests relate to holders of this office, most had held it before the reign of James I. The likelihood of their having been prototypes for silverware is thrown into doubt by the lack of any known replicas made in silver. Pinto propose that they may have been 'part of the insignia of some exclusive 17th century society', similar to, or perhaps an ancestor to, the Honorable Order of Little Bedlam, a social club founded by the 5th Earl of Exeter in 1684. The decoration would most likely have been executed with a hot thin steel implement on a carefully prepared surface, which would have been very smooth and probably glazed first. This would have been difficult to achieve, as heat could not be controlled very carefully, and so the designs may have been first finely gouged or incised and then later darkened.